After Gaura Hari, who descended to purify this age of Kali, made Himself invisible to the eyes of the world, the preaching of His religion of love carried on more or less uninterruptedly up until the time of Baladeva Vidyabhushan. In the time that followed, though there were still many advanced devotees present on the planet, a period of darkness descended on Mahaprabhu’s school of devotion. Many heterodox sects came into existence that vocally claimed to be following Mahaprabhu, but in fact were simply using His name to promote their own false doctrines. The Lord Himself could not tolerate deviation from the truths of the Gaudiya Vaishnava doctrine and He would be greatly pained by misrepresentations of the divine relations between the Lord and His devotees. For this reason, Svarupa Damodar and Rupa Goswami appeared again at the desire of Sri Chaitanya Mahaprabhu through Srila Saccidananda Bhaktivinoda Thakur and Srila Bhaktisiddhanta Saraswati Thakur Prabhupada, to preserve and protect the doctrines taught by Srila Rupa Goswami. Preaching these doctrines of pure devotion, these two great souls gave great joy to the Lord Himself and to all of his followers in the Gaudiya Vaishnava school. Between them, Srila Bhaktivinoda Thakur and Srila Prabhupada wrote more than a hundred books on devotional subjects, including translations and commentaries on the Bhagavad Gita, Srimad Bhagavatam, Chaitanya Charitamrita, Chaitanya Bhagavata, etc. By doing so, they performed an indescribable service for Gaudiya Vaishnava society. Today, those who are free from prejudice, who recognize and approve the truth and good qualities in others, lament the absence of these two great acharyas, what to speak of their disciples and grand-disciples. Those who follow the teachings and example of these two great acharyas sense their absence sorely. Nevertheless, those who truly feel their separation are fairly rare, for it is beyond the capacity of those who wish to equate materialistic activities with the spiritual to understand the contribution they made—namely their propagation and bestowal of pure devotional service consisting of the culture of those activities that are pleasing to Krishna, without any desire for liberation or sense gratification. Srila Bhaktivinoda Thakur appeared in this world in the afternoon of Sunday, Sept. 2, 1834 (Bhadra 18, 1245 Bengali), 352 years after the advent of Sri Chaitanya Mahaprabhu. His disappearance took place just before midday on June 23, 1914 (Asharh 9, 1305 Bengali year), which also happened to be the disappearance day of Gadadhar Pandit Goswami. I never had the good fortune to personally see Bhaktivinoda Thakur, though I did have the opportunity to hear of his superhuman glories directly from Srila Prabhupada, both through his spoken word and his writings. On the other hand, it is far beyond my finite capacities to adequately describe all the wonderful things that I heard and witnessed of Srila Prabhupada’s glories during my personal association with him. I saw that he would not tolerate even the slightest disrespect to the names of Lord Krishna, to His devotees, to His deity form, nor to His person. Once, he was staying as a guest at the house of a famous personality, yet he fasted for three days without his host’s knowledge, refusing even to take water out of protest to such disrespect. On another occasion, he was greatly disturbed when he heard a hereditary Goswami speak of Raghunath Das Goswami in terms of his caste of birth. There were many incidents of this type. He could be as fierce as thunder when arguing against heretical doctrines, but when relishing the flavors of pure devotion, he revealed a greater softness than that of a flower, shedding tears of ecstasy. Both these characteristics were seen in his dealings with his disciples, in which he proved his affectionate feelings for them. Srila Prabhupada was the personification of Sri Chaitanya Mahaprabhu’s message. Those who have deep love for their spiritual master remained immersed in the ocean of his divine instructions for as long as he was present in this world. They did everything they could to preach and act in a way that fulfilled his desires and experienced the great joy of associating with him directly in the most personal way. Now, however, in his absence, they are overwhelmed by most painful feelings of separation. The pain bursts out from their heart and tears flow from their eyes and onto their chest like the torrents of rain in the month of Shravan. Their minds are disturbed by the desire, never to be again fulfilled, of hearing their guru speak the nectarean topics of Krishna. They repeatedly sing the verses written by Narottama in which he reveals the depth of his loss at being separated from the company of the great Vaishnavas. Lost in this mood of separation, how can any consideration based on worldly competition be of interest to them? How can the witches of the desire for liberation or sense gratification remain hidden in their hearts? Our mundane feelings of attraction and aversion for material objects light the fire of envy, egoism, and hatred so much so that it seems they have the ability to destroy this world. If even a drop of pure affection arises in our hearts for the incarnation of Mahaprabhu’s magninimity, then no place will remain for these animal propensities like hatred, jealousy, or violence to others. We pray that our commitment to these last instructions of his manifest presence in this world be unfailing. May we never interpret these words to elicit secondary meanings that allow us to engage in sense gratification, but rather, single-mindedly dedicating all our energies and working together, aim for the pleasure of “the senses of the one, non-dual Supreme Truth,” making it the one and only goal of our lives. If we wish to show our love and faith for our spiritual master, it will be by following these teachings. However, rather than giving full attention to the desires of the spiritual master, we may focus on serving his body or the extensions of his body represented by temples and ashrams. If we do so, we will never be free of the pitfall of seeing the guru in purely human terms (martyasad-dhih). The Lord can only be seen through the path of transcendental sound (sruteksita-pathah) and the spiritual master, being his manifest representative, is also perceptible through divine sound vibration. From faith in the words of the spiritual master, affection for his service increases. Someone who becomes a powerful preacher or learned writer but makes no effort to put the spiritual master’s words into practice shows no actual love for him. The spiritual master can see through those who only make a show of affection for him and will surely crown with success the sincere attempts of the disciple who genuinely follows his directions. The guru is the personification of Lord Gauranga’s magninimity, therefore he will mercifully transfer power or strength to his sincere disciple. With his blessings, the blessings of the Lord are not long to follow, for the mercy of the Lord comes through that of His intimate associates. Yasya prasadad bhagavat-prasadah. My most worshipable Gurudeva, Srila Prabhupada, did not see the faults in anyone; he was most compassionate. We who aspire to become the servants of his servants and to partake of the remnants of his plate, pray to him with all the sincerity at our command that by his causeless mercy he will give us the worthiness to serve him. We pray to him to please make our hearts simple and free from deception; may he forgive us of our offenses, and consider us the servants of his servants, birth after birth. May he free us from the attractions and aversions of this world and keep us fixed in service to his lotus feet. Raghunath Das lamented the disappearance of Srila Rupa Goswami with such intensity that stones could have melted. In Rupa’s absence, he felt the entire land of Vraja to be completely empty: Govardhana was like a great python, Radha Kund the wide open mouth of a tiger, and he felt his own self to be void of life. Can we ordinary mortals imitate the eternal associates of the Lord in their feelings of separation? Narottama Das Thakur also cried and prayed fervently to his diksha guru Lokanath Goswami to attain the lotus feet of Sri Rupa Goswami, who had actualised Sriman Mahaprabhu’s heartfelt desires on this earth. Narottama Das sang that Sri Rupa was the worshipable object of his devotion, the treasure of his life, his jeweled ornament, the very source of his life, the perfection of his desire, the ocean of ecstatic feeling, his Vedic religion, his vow, his penance, his prayer and his duty. Rupa Goswami was everything to Narottama Thakur, and therefore he almost went mad out of his feelings of separation, crying day and night in the hope of receiving his mercy. If we could even feel a millionth part of what he did, our lives would be perfect; we would attain the greatest fortune. I do not know how many more lifetimes I will have to wait for this good fortune to be mine. In other words, the only way to conquer over lust, anger, greed, fear, lamentation, bewilderment, pride, envy, the three miseries and the three modes of material nature is by surrendering to the spiritual master. But if a disciple thinks the spiritual master to be nothing more than an ordinary mortal, then all his spiritual practices and worship of the Lord are simply a wasted effort. Though people may think of Krishna as an ordinary man, this does not make it an actuality. Similarly, a spiritual master’s parents, children or neighbors may see him as just another person, but a good disciple recognizes him as the visible manifestation of the Supreme Lord Himself. It is never appropriate to criticize the words or deeds of the spiritual master by saying things like, “My spiritual master should not have said that, or it was improper for him to have done some particular thing.” By doing so, we reveal our mundane concept of the guru and ultimately we become offensive by showing disrespect to him. This is the offense known as gurv-avajna. The orders of the spiritual master are to be obeyed diligently without reserve or delay—ajna gurunam hy avicaraniya. If one is incapable of following his orders, then one should fall down at his feet and pray to him with urgency for the strength and ability to do so. If the spiritual master rebukes or condemns the disciple, the disciple should still not attempt to make his case heard, even though it may be painful to listen in silence. If the disciple argues with the spiritual master, it is counted as the offense of disrespecting the guru. The disciple thus becomes unteachable and, due to his independence, falls down into indiscipline and wantonness, inevitably resulting in suffering. All such unsatisfactory disciples (sevakadhamas) demonstrate an ignorance of the spiritual master’s divine nature by their lackadaisical attitude to service. They thus end up as offenders to the spiritual master and the Holy Name. Any disciple who wishes to attain perfection in the spiritual practices given him by his spiritual master must pay careful attention not to offend him in this way. 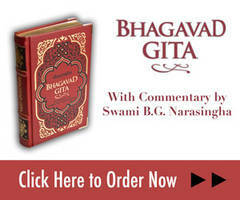 The discussion of purascarana is continued in the same chapter of the Hari-bhakti-vilasa. According to the Ägamas, the purascarana gives energy or power to the mantra. Just as an embodied being without strength is impotent and useless, so is a mantra that has never been enlivened by the performance of purascarana. Even if one should chant the mantra or perform other religious rituals for hundreds of years, he will never attain perfection in the chanting without purascarana. The basic idea behind the purascarana is to chant a certain, fixed number of mantras. Then one also performs one-tenth that number of oblations into the sacrificial fire, one-tenth of that number of oblations into water, and feeds one-tenth that number of brahmins. There is some difference of opinion about the number of oblations to be offered into water, as some say that it should be one-tenth the number of mantras chanted. Whatever the case, the rules are so stringent that it is extremely difficult for an ordinary person in this Age of Kali to complete such a vow. And if there is a disruption in the performance and any single part of the rule is not perfectly carried out, then one has to double the number of mantras and all the other parts of the vow. Therefore, the merciful Lord gives the possibility of an alternative. Of course, it should be borne in mind that the mantra does require one to take shelter of a spiritual master and to render him service. Sanatan Goswami writes in the Digdarsini that niskrtam refers to the way one releases oneself from an obligation by doing something or making a gift in payment. In view of one’s debt to the guru, one should give everything that he possess up to and including his very own soul. The fact is that no one can be free of his debt to the spiritual master, even if he gives him everything he owns. A rich householder may make a show of giving opulent gifts, but this is not the real daksina, for Krishna says to Uddhava in the Bhagavatam (SB 11.19.39): daksina jnana-sandesah—the real gift to the spiritual master is to teach others what one has received from him. If we take these instructions seriously and do everything we can to realize them, then we will one day become capable of giving the spiritual master the gift that he desires above all others. The spiritual master will be pleased and transmit unlimited power to the disciple with whom he is pleased. To the extent that we serve the spiritual master with sincerity and repeat his teachings, through the association with his words, our hearts will cry out with the desire for the good fortune to be associated with him by directly seeing, touching and serving him directly. Only then will we be able to understand the true spirit of separation. We will then know that he is Radharani’s personal associate who, in the form of Nayanamani Manjari has entered Radha and Govinda’s eternal pastimes and is there immersed in the ocean of service to the Divine Couple. When we feel this mood of separation, the desire to dedicate our lives for attaining this service will awaken. “The spiritual master, who has given me the eyes to see the true purpose of life, is my master birth after birth” (caksu-dana dila je, janme janme prabhu se). He is our lord and master lifetime after lifetime. We pray that he will be merciful and transform us lowly creatures by giving us the strength to put his message into practice and to preach that message, and then when the time of death comes, he will take us back to his lotus feet, making us his own for eternity. Being distanced from the spiritual master is a source of great pain. We pray that Srila Prabhupada will give us a place at his lotus feet even though we are the most unworthy servants of his servants, so that we may be able to render service to the Divine Couple according to his direction and by following his example. Our only authority to make such an audacious prayer is that we have taken the remnants of his servants’ food. We know that we have no right to make such a request of you, but to whom can we turn other than you, our spiritual master? By your grace, everything that would ordinarily be impossible becomes possible in a moment. Though today all our efforts are nothing but a joke, like those of a dwarf who tries to touch the moon, are your blessings not capable of effecting any miracle? Will they not give us a love for chanting the Holy Names without offense? Has Bhaktivinoda Thakur not sung of the power of the Holy Name to give us the realization of our eternal spiritual identity? Thus, by the blessing of the spiritual master, we will be able to receive the mercy of the Holy Name and then, all perfections will come through the Holy Name as Mahaprabhu Himself promised: iha haite sarva-siddhi haibe sabara. When Krishna gives His mercy as the caittya-guru, then He gives the kind of firm and pure intelligence through which the devotee gains expertise in bhajan, or sasanga-bhajana. Externally, the mahanta-guru gives initiation in the mantra and instruction in the practice of bhajan to the disciple who takes shelter of him. No one can advance or attain perfection in bhajan without serving the spiritual master with faith (visrambhena guroh seva). The word visrambha means faith, affection and love. It thus refers to the kind of submissive questioning and surrender as well as the affectionate service mentioned in the Bhagavad Gita’s famous verse summarizing the disciple’s dealings with the spiritual master. One who acts in this way quickly becomes worthy of receiving the spiritual master’s blessings and in due time learns in detail about the three categories of divine knowledge, namely sambandha, abhidheya and prayojana. Service to the guru in affection and love is possible both in this world and the next. The spiritual master is always participating in the eternally pure realm and is never under the thrall of birth and death in this world. One should never think of him as an ordinary mortal. By serving his teachings when he is no longer visible to our mundane eyes, we can get a vision of his transcendental form. Just like the Supreme Lord, the guru knows what is to be known, including all of us, but he is not known to anyone (sa vetti vedyam na ca tasyasti vetta). We cannot know him through our own power; it is only when he mercifully decides to reveal himself to us that we will achieve the great fortune of being able to see him. Therefore, the famous saying, guru-krpa hi kevalam (“the spiritual master’s blessings are our only salvation”) is appropriate.